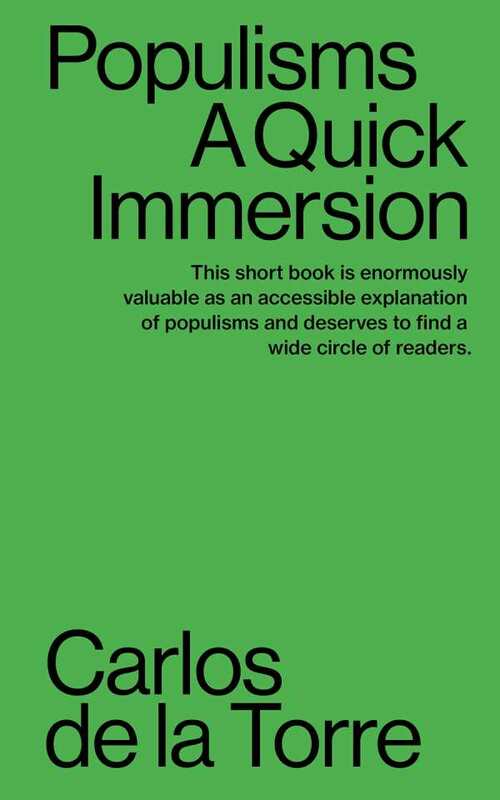 Populism has become one of the defining political movements of the twenty-first century, and Carlos de la Torre’s Populisms: A Quick Immersion works to demystify it. Taking on, and taking down, some of the biggest misconceptions about populism, de la Torre notes that, despite what antipopulists say, there is nothing protofascist about populism, even right-wing populism. Populists past and present rarely seek to do away with democracy, and in fact agitate for greater democracy for the masses. Though Donald Trump and the late Hugo Chávez could not be more dissimilar (de la Torre says Trump’s brand of populism “aims to recreate a nostalgic white, patriarchal and heterosexual America,” while Chávez worked to “transform society” in Venezuela), both are shown share a similar logic—because populism, no matter the color, is predicated upon politicizing grievances and seeing enemies in opposing parties. Eminently approachable—both scholarly and accessible—the book’s chapters are brief and focused, with academic jargon kept to a blissful minimum. This quick immersive study walks its audience through what populism looks like in different situations, including in different countries and time periods. While it is not exhaustive nor interested in history before the twentieth century, it is a workable blueprint for how populist movements attain and hold power. The text is conversant with American historian Richard Hofstadter’s work on populism from the 1940s and 1950s, and Hofstadter’s views on the low education levels of populists influence de la Torre’s findings, perhaps to their detriment. The book also shows a clear preference for left-wing populists over their right-wing peers. Populisms explains and expands upon the definition of populism. Few books touch a contemporary nerve quite like this one.